control how much time your children spend online, you should lead by example. “You cannot expect your children to not spend time online or on the phone, if you yourself can’t keep your phone away. I am very particular when it comes to spending time with my family and follow certain rules like no phone while at the dining table or keeping the phone away an hour before we sleep. This helps us bond as a family and also the children imbibe the habit easily without us having to constantly nag them,” shares Maria. Experts also say that parents should be open to their children about what they shouldn’t be watching on the internet. 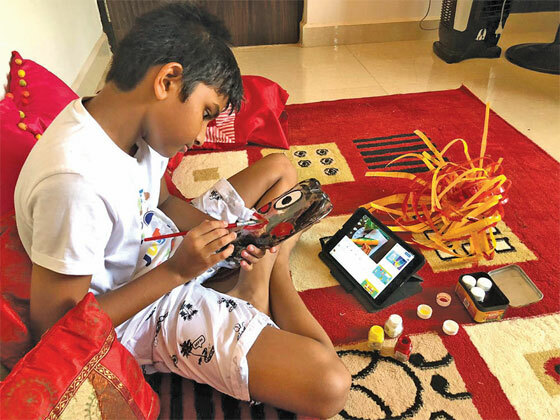 Rather than putting parental controls and building their curiosity, it is better to be candid with them and share what all is available on the internet and where they should draw the line or talk about the right age to watch certain things. However, the latest news suggests that a lot of parody videos and obscure cartoons (mostly anime) have begun influencing children’s minds. who mostly looks after her younger cousins, nieces and nephews, shares her experience: “One of my younger cousins at the age of three, used watch cartoons like ‘Dora the Explorer’. However, there were many parody versions on Youtube and once we caught her watching a video of pregnant Dora, after which, she started saying ‘even I want to have a baby’.” Jane says that it is not her mistake as most of the time parents are ignorant out what all is available on the internet and how easily kids can come across things no meant for them. It is also important to focus on how to balance what they watch. a housewife, says that she is not upset with what her children watch online. “My elder son, now a teenager, still watches those old Cartoon Network shows on Youtube, and sometimes English movies too. But he also spends a lot of time online, watching videos of how to create something, or learning photo editing, etc,” she explains.